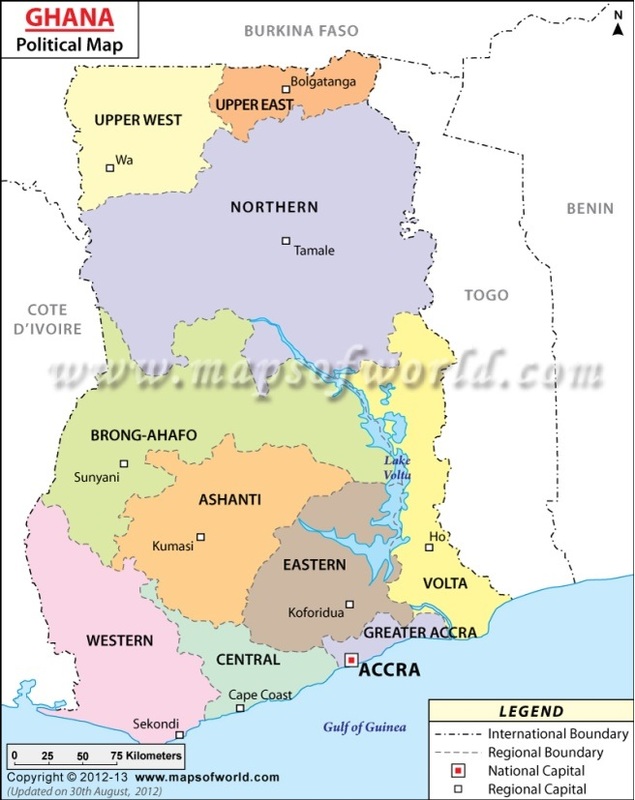 The Republic of Ghana is located on the West Coast of Africa, situated between latitudes 4o and 11o north of the equator. It is bordered by Togo on the east, Côte D’Ivoire on the west, Burkina Faso on the north and the Atlantic Ocean on the south. Ghana is characterized by a tropical climate but the annual rainfall level decreases as the altitude increases to the north, where Savannah climate becomes dominant. Most part of the country belongs to the Tropical Savannas Climate and the Sub-Sahelian African moist region. The annual mean temperature ranges from 25oC to 27oC and is fairly constant throughout the year. The annual rainfall is as high as 2,000 mm in the southwestern part of the country but decreases towards the northeast, dropping to 1,000 mm at the northern border area. English. Major local dialects; Akan (or Twi), Ewe, Dagbani, Nzema and Ga/Adangbe. In all, there are about 60 different languages. Christianity (71.2%), Islam (17.6%), Traditional (5.2%), Others (6%). bovine meat frozen; rice; Undenatured Ethyl Alcohol & spirits; pharmaceuticals; fabrics & readymades; flat-rolled iron products; pre-fabricated structures, insulated wires & cables; motor vehicles & automobiles; self-propelled heavy machinery; cereals; made-up textiles, etc. Total over USD 1. 4 billion over the past two decades including FDIs; Local Diaspora investments and Third country NRI investments. Ghana Investment Promotion Center reported that in 2017, the total investments by Indian companies in Ghana was US$453.75 mn with a total of 22 projects registered with them (probably including the USD 398.33 million Buyer’s Credit for the Tema-Akosombo railway project) and India was second largest both in terms of projects and quantum of FDIs. The estimated number of Indians living in Ghana is about 10,000 persons out of which about 3,000 hold foreign nationalities. Some of them have been in Ghana for over 70 years. (Majority of the older generation of PIOs are Gujaratis and Sindhis). The business activities of Indians in Ghana have contributed in a major way to the economic development of Ghana and are well appreciated. Indian companies are the second highest investor in Ghana in terms of number of projects. The NRIs in Ghana are mainly middle level employees of companies operating in Ghana, both Indian-origin owned as well as foreign companies, particularly in the marketing, finance and accounts, etc. They hail from various States in India (Kerala, Tamil Nadu, Karnataka, Andhra, Maharashtra, UP, West Bengal, Orissa and Punjab). Indian investments are listed by Ghana Investment Promotion Center data. These include (a) investments by Indian companies; (b) investments by PIOs based in Ghana who may still hold Indian nationalities; (c) Investments from third countries where one of the partners may be Indian or where the parent company is an Indian registered company in a third country. Hene this data cannot be corroborated either by Indian FDI-outflows or by UNCTAD data.